Las Vegas is the Sacramento Tribe’s kind of town. The team repeated as Las Vegas Open 55-and-over champions with a 20-2 sandpapering of the Aqua Dulce Reds. 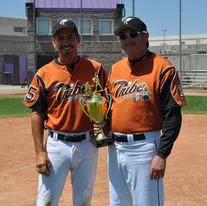 There’s no other way to put it – the Tribe simply mashed the ball to dominate the oldest wood bat division age group at this tournament. They scored their 20 runs on 29 hits against a very good Reds team. Rex Yuhas led the charge with a 4-for-5, four RBI performance. Gary Kleinfeldt had four hits and three RBI. Mike Thatcher, Phil Gelhaus, Berlin Germany, Sr., and Darby Foster all had three hits each with Tim Burkitt and Thatcher driving in three runs each. The Tribe notched seven runs – including five with two outs – in the second inning. The onslaught continued with a six run third in which Steve Welch’s screaming line drive drilled the elbow of the base umpire who had to be removed from the game. Gary Stonebrook, meanwhile, kept the Reds in check. He threw a complete game in which he struck out four, walked one. Kleinfeldt took home tournament MVP honors. “He hit the ball well throughout the tournament and played great defense,” said Manager Ken Chavez.The Reds were disappointed by the loss, but, to their credit, continued to play hard to the bitter end. The door of optimism opened a crack in the sixth inning when Bruce Hirota stroked a two-run single to drive in Doc Rubio and Steve Barnhart. WP—Gary Stonebrook. Leading Hitters—(Tribe) 4-hits: Yuhas+ 4 RBI; Kleinfeldt +3 RBI; 3Hits – Thatcher+3RBI; Gelhaus; Germany; Foster 3×5. Burkitt 3 RBI. (Reds) Hirota 2 RBI.